The Boston Bruins are advancing to the second-round of the 2018 Stanley Cup Playoffs. After a grueling matchup with the Toronto Maple Leafs that went the distance, the Bruins came out on top courtesy of a 7-4 victory Wednesday night that guaranteed the Bruins a matchup with the Tampa Bay Lightning. It was a tough seven games that could have gone either way, but the Bruins ultimately outplayed the Maple Leafs in multiple facets of the series despite what the final record may indicate. While there were some players who could have done better in the series, namely Tuukka Rask, Charlie McAvoy and even David Krejci (despite his eight points in seven games), there were a handful of players who really stepped up and pulled their weight. Of those players, only three made the list of “three stars” from the first-round. While the 5-foot-9 defender may not have been the most dependable player in his own zone throughout the first-round series against Toronto, Torey Krug’s ability to produce offense was invaluable to the Bruins. 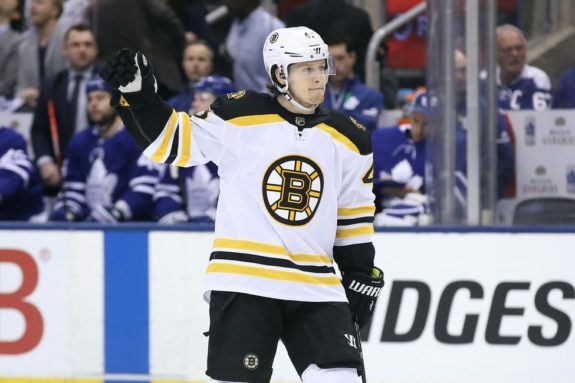 In a seven-game series that could have gone either way, Krug managed to score two goals and nine points, giving him the second most on the team behind only David Pastrnak. To put that in perspective, Krug had previously scored four goals and six points in 15 games in 2013 and recorded two goals and 10 points in 12 games in 2014. He will almost undoubtedly set a new career-high in points in the Bruins’ second-round matchup against the Tampa Bay Lightning as he only needs one point to tie his previous best mark. Averaging over 21 minutes a night in the first-round and taking 26 shots on goal – second on the team, again, behind only Pastrnak, Krug stepped up in a big way for the Bruins when they needed him. His production was impressive in itself but what really stood out, however, was the poise that he played with. He may not be the team’s go-to option in defensive situations, but he’s earned his reputation as a bonafide top-four defender with a lethal scoring touch. Making Jake DeBrusk the Bruins’ second-star was an incredibly hard decision. Not because he wasn’t deserving of the nod but because he did so much for the Bruins against the Maple Leafs in all seven games that he could have easily been the first star. Scoring five goals and seven points in seven games for the Bruins, including two in Game 7, DeBrusk made a splash in his first postseason series in the NHL. His explosive offense was something to take note of each and every time he took the ice and even when he wasn’t scoring, he made more of an impact that arguably any other player in the Bruins’ lineup. 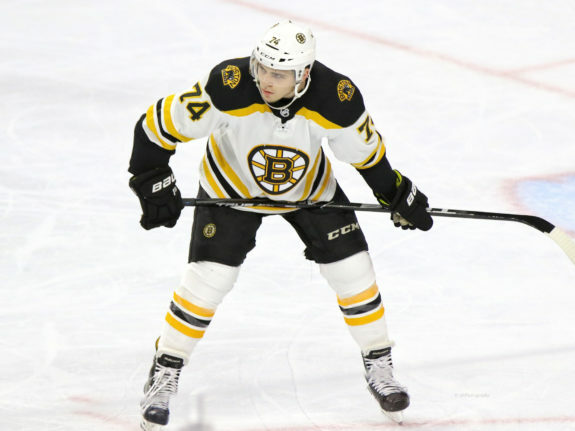 Whether it was playing hard on the forecheck, going to the corners and the dirty areas of the ice, driving the net or laying out a big hit, DeBrusk proved that he was more than deserving of a pick in the top-15 selection in 2015. Overcoming adversity that he’s faced his entire career, the 21-year-old is making his name in Boston and around the league as one of the best young players in the NHL. Playing consistent top-six minutes alongside Krejci, DeBrusk has not only done what’s been asked of him, but he’s gone above and beyond and created enough energy to get his team going whenever they needed the jump-start. Though Krejci may have been on the wrong end of some costly turnovers in the series he still finished with two goals and eight points in seven games. Much of that success can be attributed to DeBrusk. DeBrusk has been the best partner that the veteran center has had in years. It wouldn’t be a stretch to say that he was the team’s most consistently good forward all series long. If anyone was going to take the first star away from DeBrusk, it had to be Pastrnak. The 21-year-old right winger not only led the Bruins in goals (tied for first with DeBrusk at five apiece), but he also led them in assists (eight) and points (13) in only seven games. After a relatively slow postseason run in 2017 with two goals and four points in six games, Pastrnak jump-started the Bruins in this series and was largely responsible for their production in the first two games of the series. Earning his spot on the team’s top line alongside Patrice Bergeron and Brad Marchand, Pastrnak’s ability to play in all situations and create opportunities for his team in all three zones and in any situation has made him as crucial to the Bruins as his linemates. 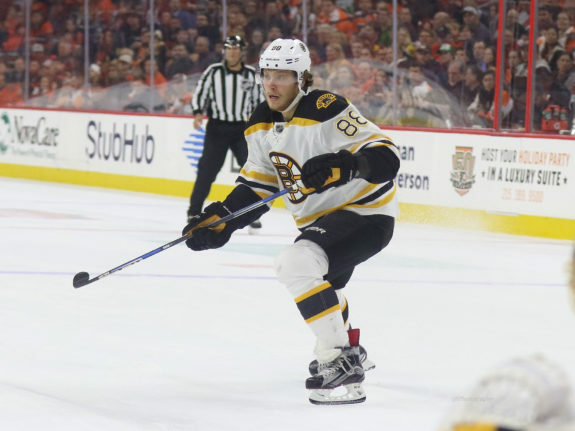 After scoring 35 goals and 80 points in 82 regular season games this season, Pastrnak’s offensive production in the first-round shouldn’t come as too much of a surprise. Still, it isn’t that uncommon to see top producers slow down once the postseason begins. For Pastrnak, that simply wasn’t the case. With a goofy and contagious smile seemingly permanently stuck on his face, Pastrnak was the Bruins best forward this series and deserves the first-star honors for his hard work and production.